and other popular money-market instruments. 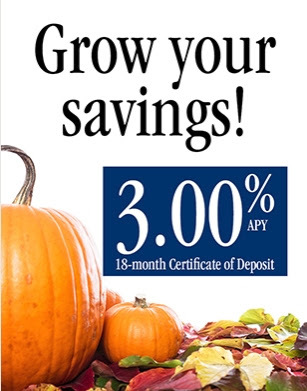 Right now, Washington Trust is offering a phenomenal 3.00% APY on a promotional 18-month certificate of deposit. Poke around and see if you can find a better rate on an 18-month CD. I doubt you'll find one. Click Here to take advantage of this deal. The 3.00% APY promotional rate is effective as of November 24, 2018. Washington Trust has been around since 1800. It is the oldest community bank in the United States. Click here for more on the bank's history. If you are lucky enough to live in Colorado, Advantage Bank has an extremely competitive certificate of deposit (CD) rate for you: 2.30% APY (2.29% interest rate) on a 24 month CD. To get this rate, your minimum deposit must be $9,999.01. Click here for more information on Advantage Bank's CD rates. Click here for branch locations and contact information. "...In 1983, Mike Wentz and his wife had a daughter, Amanda. So, they bought a $1,000 certificate of deposit for her. Mr. Wentz remembered making the decision. 'I have a new baby, so let me make an investment,' he recalled. Fast forward to 2009, when Mike surprised his daughter with the CD and quickly found himself quite surprised. 'She calls me the next day, and she says, ‘Dad, I went to the bank. They don’t know anything about it,’' he said. Mike said he logged eight years fighting Wells Fargo when he finally called NBC Bay Area Responds for help. 'I had actually tried – I hate to say this – with another local station, and they turned me down,' he said. We stepped up. Mike showed us a CD that should have renewed every 30 months. 'It says right on here, with automatic renewal provision,' he read from the paper certificate. Mike stopped getting statements in the 80’s, but figured as long as he kept his checking account open and held the certificate he was set. Wells Fargo says the certificate is just a receipt. Also, it only keeps records seven years. So, Mike gets nothing for a CD issued 34 years ago. 'His complaint was very detailed, to a ‘T,’' said Lindsey Boyd from our NBC Bay Area Responds team. Boyd contacted Wells Fargo headquarters, while Mike kept applying pressure at the branch -- where he said workers offered the most sympathy. It wasn’t long before the bank paid the CD in full, plus interest. It was a grand total of more than $5,000. Wells Fargo declined to discuss details, citing privacy. However, a spokesperson indicated Mike's auto-renewing CD had somehow gone dormant. Mike insists he had, and accused Wells Fargo of changing its story over the years. 'At one point they tried to tell me the CD never even existed,' he said. Mike isn’t alone. Each year, hundreds of people file formal federal complaints about CD’s. The trend is upward. 832 people complained to the Office of the Comptroller of the Currency in 2017. That was more than double the number filed in 2015. 'We have received some similar questions from consumers,' said Kimberly Palmer, a Nerdwallet finance writer. Palmer said federal law only requires banks to keep records five years. So, the burden is on you to keep a paper trail. If your account statements suddenly stop, Palmer said you need to take action. 'Immediately, you want to call your bank right away if you haven’t heard from them or if you’re not sure of the standing of your CD,' she said. Money from dormant bank accounts is supposed to be transferred to the state’s unclaimed property division. Mike says that did not happen with his missing CD. Wells Fargo didn’t have records of that either. Yet another reason to keep your bank records yourself. Mike Wentz is keeping his Wells Fargo account open, despite the drama. However, he does fear some bad actors in banking are pinching good savers. 'If it were me, and I worked for a bank, I would be looking into my systems to figure out why this is going on,' he said..."
"...Sallie Mae Bank -- the retail banking arm of Sallie Mae, the nation’s saving, planning, and paying for college company -- today announced new, competitive interest rates on its high-yield savings, certificate of deposit (CD), and money market accounts, increasing them to some of the most favorable yields available in today’s marketplace. Sallie Mae Bank’s money market account now carries a 1.50 percent annual percentage yield (APY), which is 16 times higher than the Bankrate.com national average. The account requires no minimum balance to open the account and has no monthly maintenance fees. Customers can transfer money free of charge, and easily manage their accounts online. Sallie Mae Bank’s high-yield savings account now carries a 1.35 percent APY -- 11 times higher than the Bankrate.com national average -- with no minimum balance to open the account and no monthly maintenance fees. Customers can also transfer money free of charge and easily manage their accounts online. In addition, Sallie Mae Bank’s 12-month CD is now available at a 2.00 percent APY, while the 18-month CD offers a 2.05 percent APY, the 24-month CD carries a 2.30 percent APY, the 36-month CD now has a 2.20 percent APY, and the 60-month CD offers a 2.50 percent APY. Sallie Mae Bank’s CDs have no monthly fees and guaranteed rates over the life of the account, with a minimum balance of $2,500. 'We are committed to helping our customers save for college and other financial goals with responsible, sound, and competitively priced banking products and services,' said Paul Thome, president, Sallie Mae Bank. 'Our new savings rates -- which are some of the most competitive in the market today -- can help families do just that.'..." * = Advertised Interest Rate and Annual Percentage Yield (APY) for Certificates of Deposit may change after maturity, apply to personal accounts only, and are accurate as of 02/09/2018. A penalty may be charged for early withdrawal. Fees could reduce earnings. Please refer to the Account Terms and Conditions Agreement for details. § = Rates listed in this table were updated on August 21, 2018.